"Square". Free WordPress theme — WebTalkTo Montreal studio. 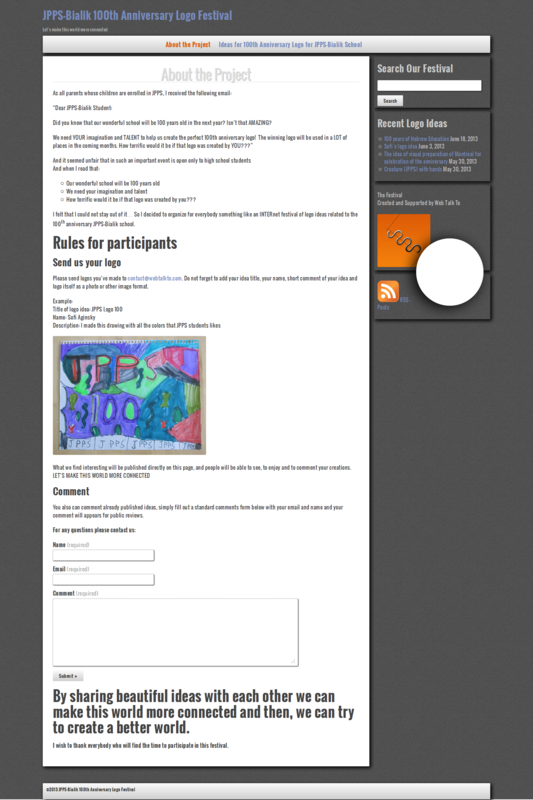 WordPress theme design and development (PHP WordPress). Web Talk To's theme Square is the logical end (one of many) of my practice on visualization of ideas. I like to use the word etude. I am completely satisfied with the current version (version 1) of Web Talk To website. Nevertheless I constantly think over other design solutions for the site. Square is the result of such work. The result of creative search. Square can be defined, as a child theme of our website. I decided to issue Square as an independent WordPress theme and allow to people to use it for free. Square intended to be viewed on any size device. It will have great look from smartphone and tablet up to the HiDPI screen. 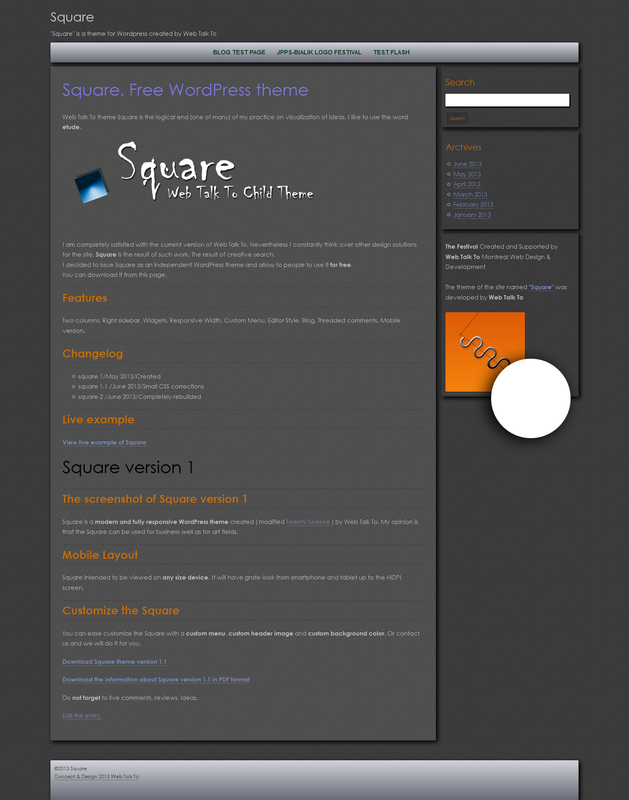 Square is a modern and fully responsive WordPress theme created by Web Talk To. 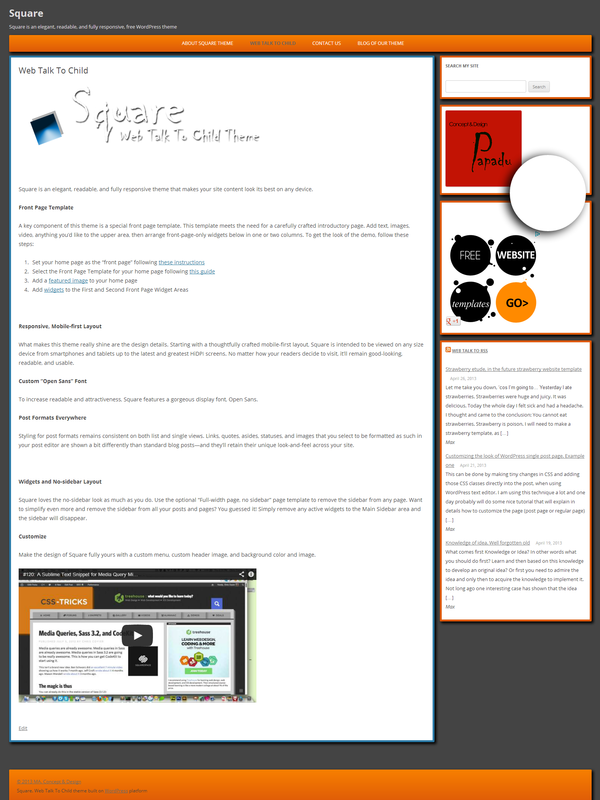 Square is a modern and fully responsive WordPress theme created ( modified Twenty Twelwe ) by Web Talk To. My opinion is that the Square can be used for business well as for art fields. You can ease customize the Square with a custom menu, custom header image and custom background color. Or contact us and we will do it for you. Do not forget to live comments, reviews, ideas.